Los Angeles, CA – (May 25, 2018) – Dark Star Pictures has acquired North American rights to Steve Mitchell's King Cohen, the true story of writer, producer, director, creator and all-around maverick, Larry Cohen. Dark Star is planning a July 7th theatrical roll-out followed by an August 14th VOD release. Dark Star Pictures President Michael Repsch negotiated the deal with Bill Straus of Bridge Entertainment. "Larry Cohen is one of a kind – a true film auteur. Steve Mitchell has brilliantly captured his essence and passion in this very entertaining and also informative film. We're ecstatic to bring this work to North American audiences" says Michael Repsch, President of Dark Star Pictures. "We couldn't be more delighted to have Dark Star Pictures unleash KING COHEN on North America," says producer Matt Verboys. "They completely get Larry Cohen's indelible impact on cinema and are perfectly suited to get this film in front of enthusiastic viewers!" King Cohen had its US premiere at Fantastic Fest in 2017, was an official selection at DOC NYC 2017, and has since screened around the world, in Austria, Ireland, Amsterdam and more, ensnaring raves. Cohen, best known for resourceful low-budget horror and thriller films that combine social commentary with prerequisite scares and welcome humor, is responsible for celluloid classics including Black Caesar, It's Alive, Q: The Winged Serpent, and The Stuff. He was also a major player in the Blaxploitation films of the 1970s, as well as a prominent Hollywood screenwriter (Phone Booth). Mitchell's film features interviews with such industry luminaries as Martin Scorsese, J.J Abrams, Joe Dante, Mick Garris, John Landis, Fred Williamson as well as Cohen himself. 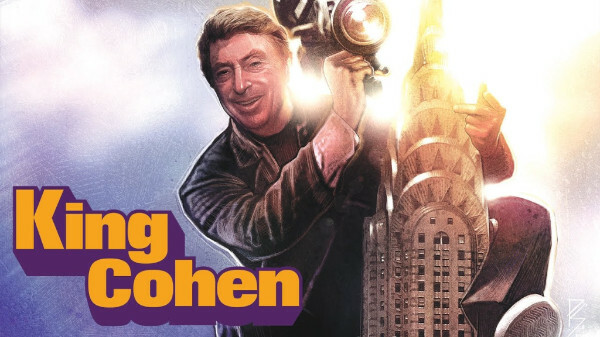 Cohen's remarkable one-of-a-kind career, from 60's TV series creator (Branded, The Invaders), to 70's and 80's independent film icon and beyond, is chronicled with freewheeling and insightful verve. Winner of the 2017 Fantasia Fest Best Documentary Feature Audience Award, King Cohen hails from Rondo Award-winning writer/director Steve Mitchell, whose film and television credits include co-writing the beloved cult horror/comedy Chopping Mall. King Cohen is a La-La Land Entertainment production, in association with Big And Tall Pictures and Off The Cliff Productions. It is directed and produced by Steve Mitchell and produced by Matt Verboys and Dan McKeon. Synopsis: Buckle up for KING COHEN, the true story of writer, producer, director, creator and all-around maverick, Larry Cohen (Black Caesar, It's Alive, Q: The Winged Serpent, The Stuff). Told through compelling live interviews, stills and film/TV clips, the people who helped fulfill his vision, and industry icons such as Martin Scorsese, J.J. Abrams, John Landis, Michael Moriarty, Fred Williamson, Yaphet Kotto and many more, including Larry himself, bring one-of-a-kind insight into the work, process and legacy of a true American film auteur. Few can boast of a career as remarkable or prolific, spanning more than 50 years of entertaining audiences worldwide.